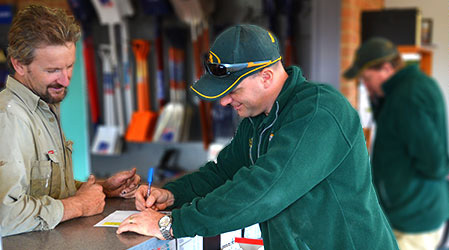 At Budget Landscape and Building Supplies we pride ourselves on our friendly efficient service and competitive pricing across our huge range of products and services. Our aim is to be the leading supplier in the south of Adelaide for all landscaping, paving, retaining wall and building needs to trade and retail customers. Our extensive range of landscape and building products are located just off Lonsdale Highway in Sheidow Park on over 2 acres of easily accessible property. With our fleet of delivery vehicles including a 14 tonne tandem tipper we can offer prompt deliveries of all size loads, usually within an hour of ordering. We also have free 1 hour loan trailers available for your convenience, so please come and visit us at Budget Landscapes and Building Supplies. You can rest assured in the knowledge that Budget Landscape and Building Supplies back everything we supply and promote and will always have one of our friendly staff members available to answer any of your questions. If you have any questions or can’t find information here on a product or service you require, please give us a call and we will do our best to help you. Product returns subject to our credit policy, includes a 25% restocking fee plus freight, claims for a damaged or faulty product must be in 7 days. Specialty orders are only credited at our discretion. A handling charge may apply. All goods remain the property of the Vendor until paid for in full. Goods are at the Purchaser’s risk from the moment of delivery. No responsibility is taken for goods delivered to unattended sites. STRICTLY payment before delivery. Interest may be charged on overdue amounts. Goods not paid for in full may be recovered from the customer at our discretion and without notice. We take no responsibility for over or under calculations of product quantities on your behalf. We will not accept return for credit or product left over and we cannot be held liable if you run out of the product. We accept no liability for damage if directed to drive over existing concrete or paving. We endeavour to ensure the colour and texture of our product matches those on display. However, as a result of the natural materials used and the manufacturing process, some variation is inherent. Variations can be minimised by blending the product when laying and on large orders by purchasing all at the one time. Some chipping of the product may occur through delivery and handling. Industry practice is to use these for cutting. Please allow a minimum of 5% wastage on any order for this reason. Strictly payment prior to or on delivery, unless pre-arranged with management. All deliveries are on a kerbside delivery basis. However, should the purchaser require the materials elsewhere, Budget Landscape & Building Supplies and/or it’s trading companies accept no responsibility to any damage to property. Any claims regarding the materials must be made within seven days from delivery. Goods remain the property of the company until paid. No responsibility is taken for goods delivered to unattended sites.